The idea of food products as dietary supplement delivery devices gets another evangelist this spring: BordenEssentials is among the first packaged cheese to provide consumers with asource of antioxidants. The products were introduced by Dairy Farmers ofAmerica, Inc., which represents more than 18,000 dairy farmers. Antioxidants are molecules that protect cells from the damage caused byfree radicals, which are formed through a process called oxidation.Antioxidants, such as beta-carotene, lycopene, and vitamins A, C and E,interact with and stabilize free radicals.Borden Essentials contains vitamins A and E. One serving of BordenEssentials contains 20 percent of the recommended daily value of eachvitamin based on a 2,000 calorie diet. Two varieties of Borden Essentialsare distributed nationally:• 2% milk singles – 16 individually wrapped slices in a 10 2/3-ouncepackage• Mozzarella string cheese – 12 individually wrapped sticks, low-fatpart-skim, in a 10-ounce package. Recipes and a list of stores where Borden cheese products are sold can be found online. SPREAD 1 side of each slice of bread with butter. Spread other side of eachslice of bread with honey-mustard. 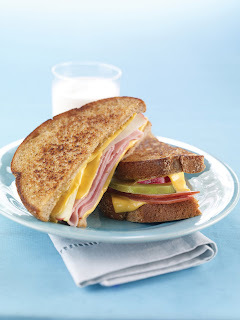 LAYER cheese, ham and apple on honey-mustard side of bread. Top withremaining slice of bread, honey-mustard side down. COOK in skillet over medium heat, turning once, until golden brown andcheese is melted.